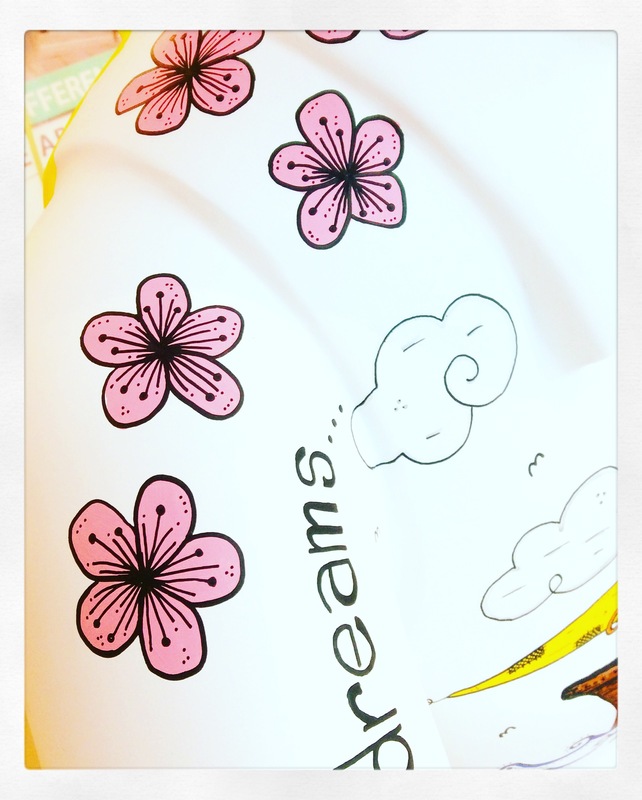 A picture speaks a thousand words… and tells of a thousand dreams. 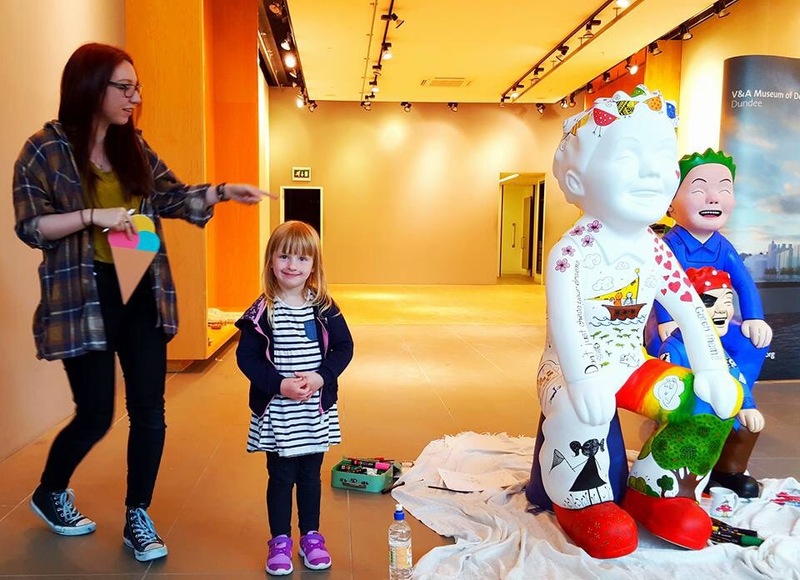 Suzanne Scott of WhimSicAL LusH is a Dundee artist and illustrator on a mission to tell as many stories as she can through her work. 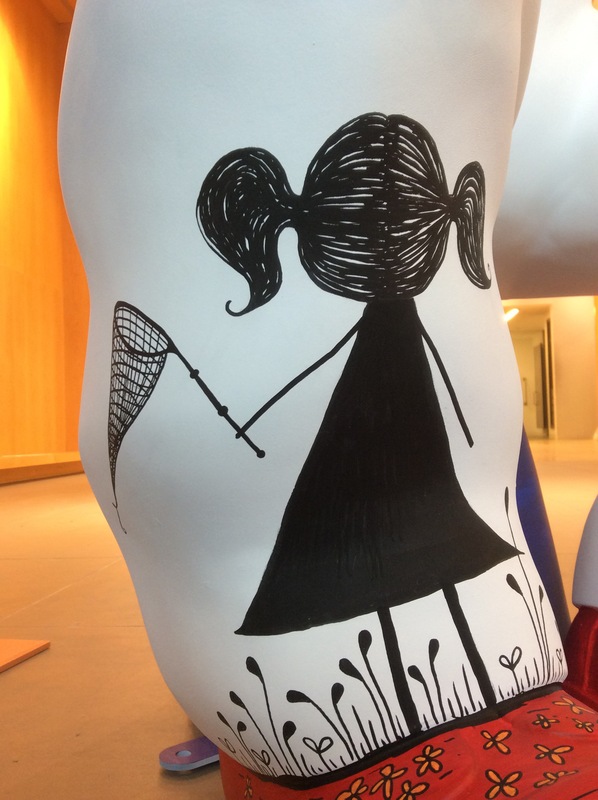 Not just tales of her own but stories from those she meets and of those who inspire her. 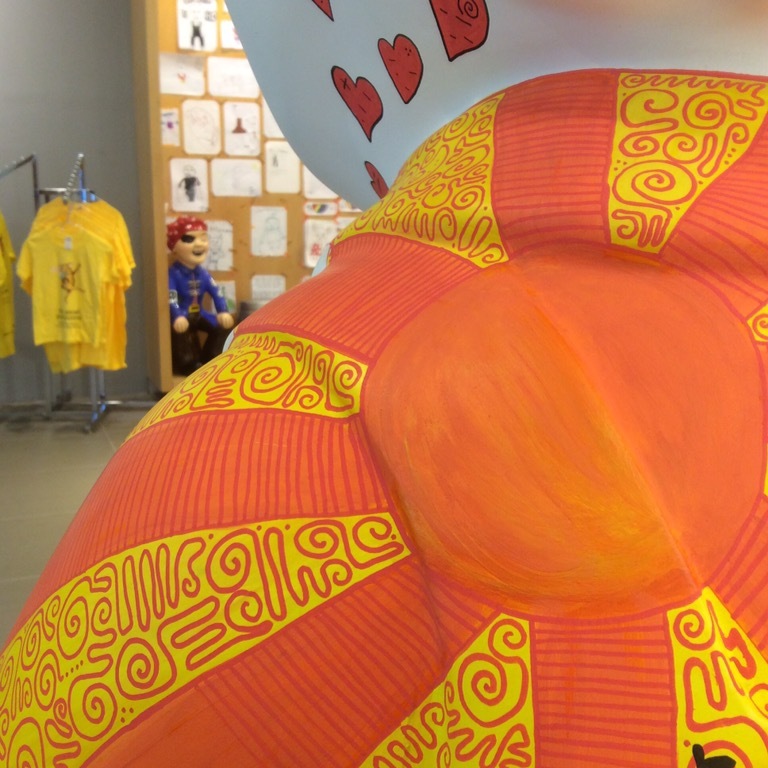 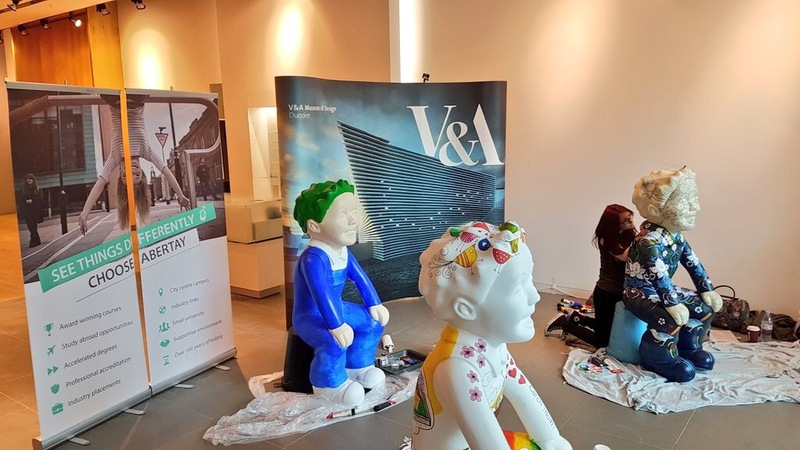 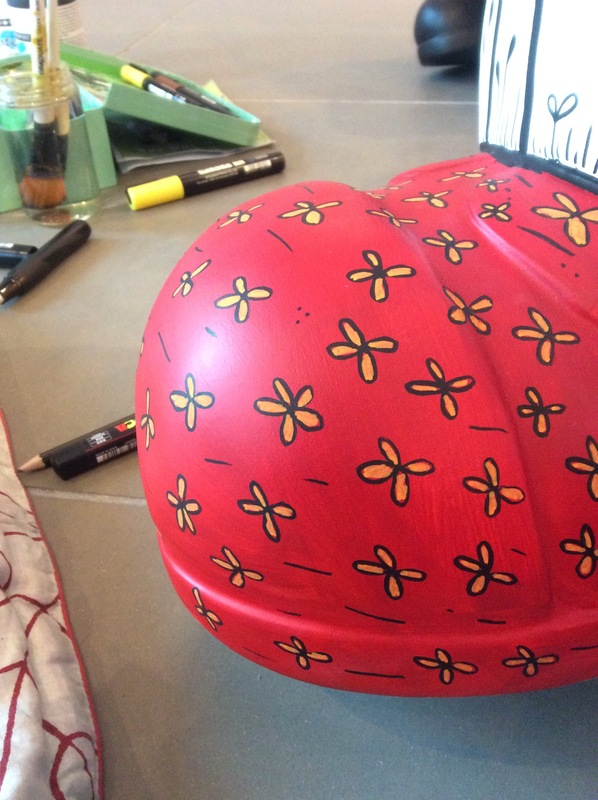 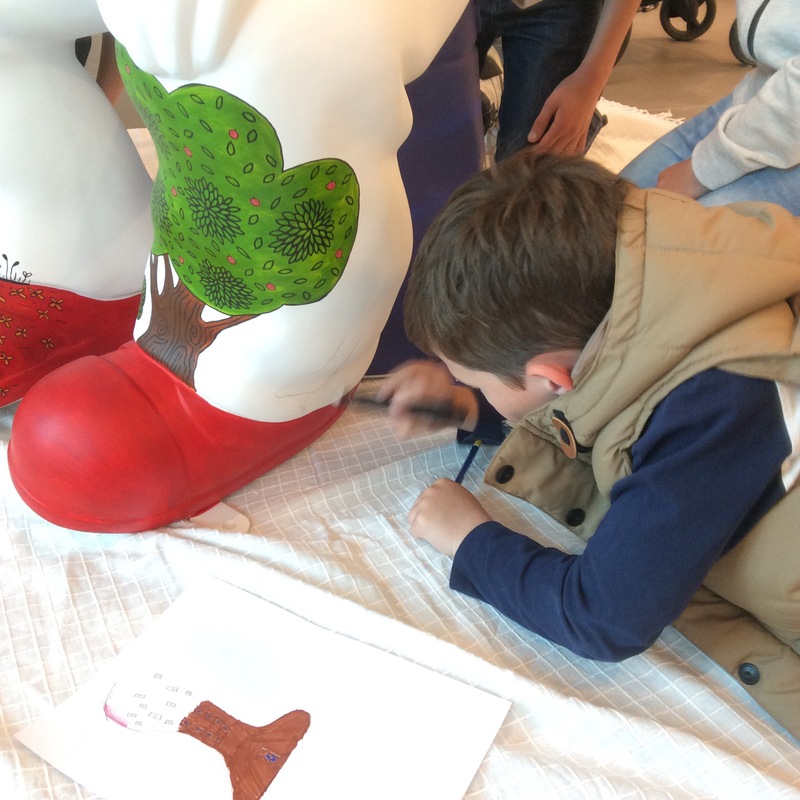 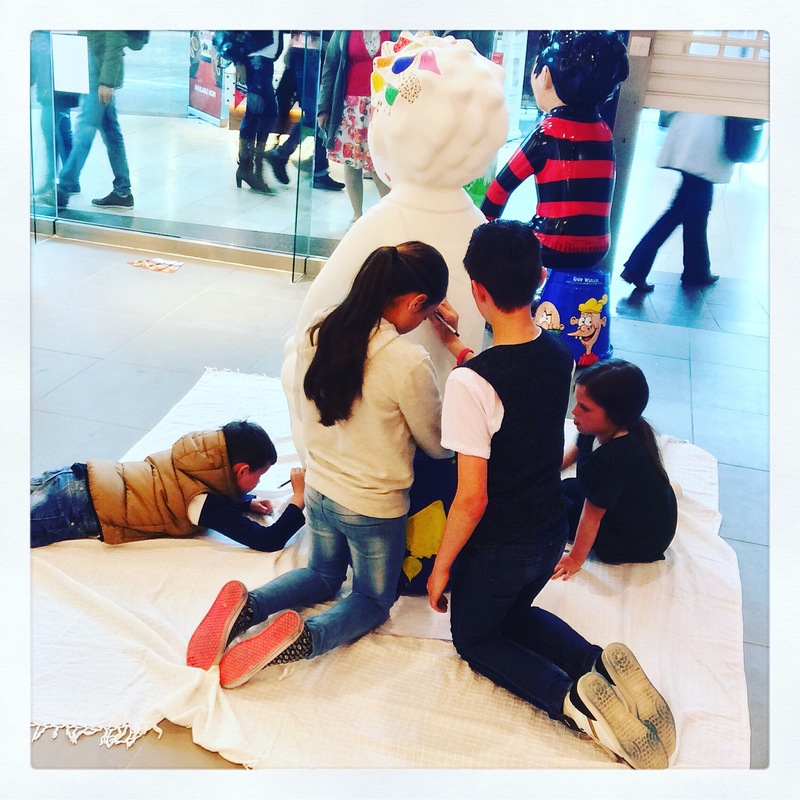 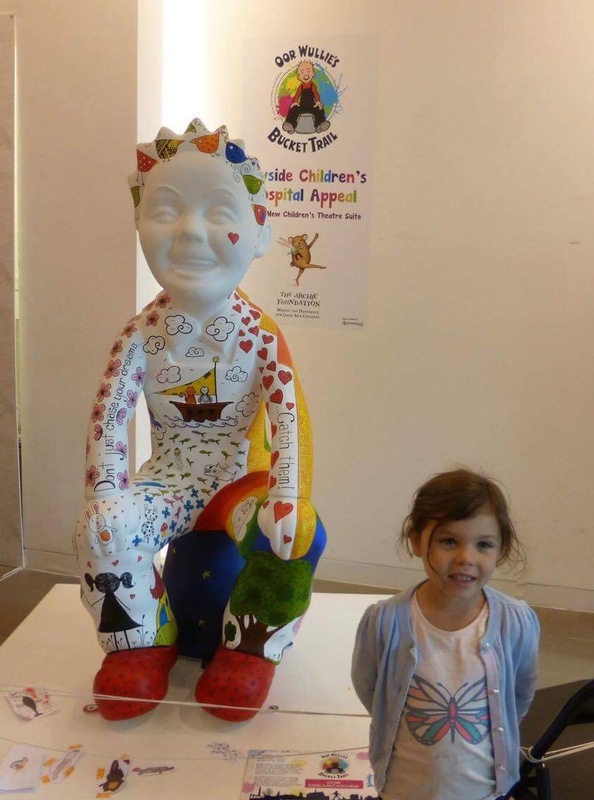 As a trail artist (and the artist co-ordinator) for the Oor Wullie Bucket Trail she was delighted when the chance arose to design and paint a second trail sculpture, Oor Dreamcatcher. 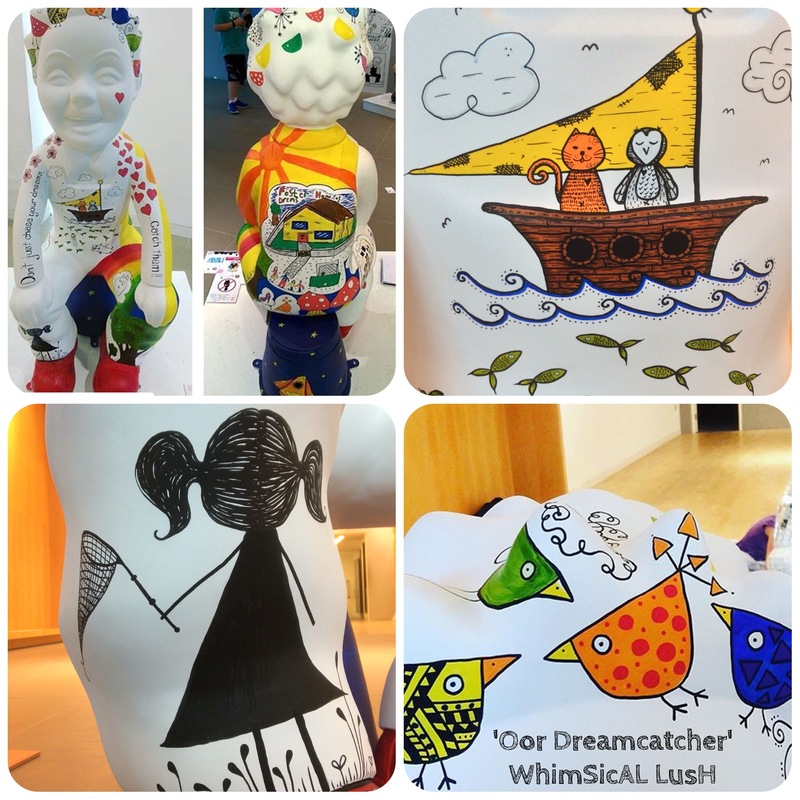 Rather than doing this one alone she gathered together lots of young helpers to talk about their dreams and then encouraged them to catch them too in the form of quirky, colourful illustrations that now appear all over Oor Dreamcatcher. 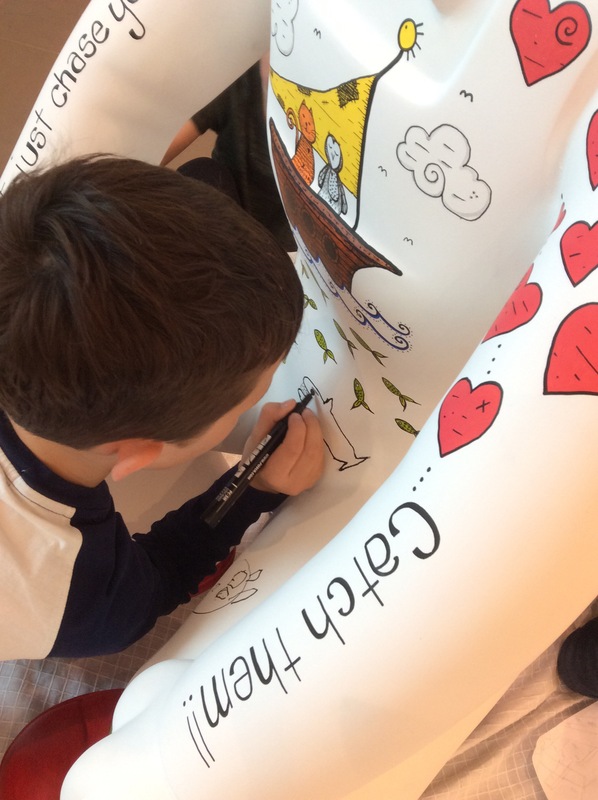 Suzanne started with some of her own illustrations so that the youngsters weren’t too daunted by such a big white canvas. 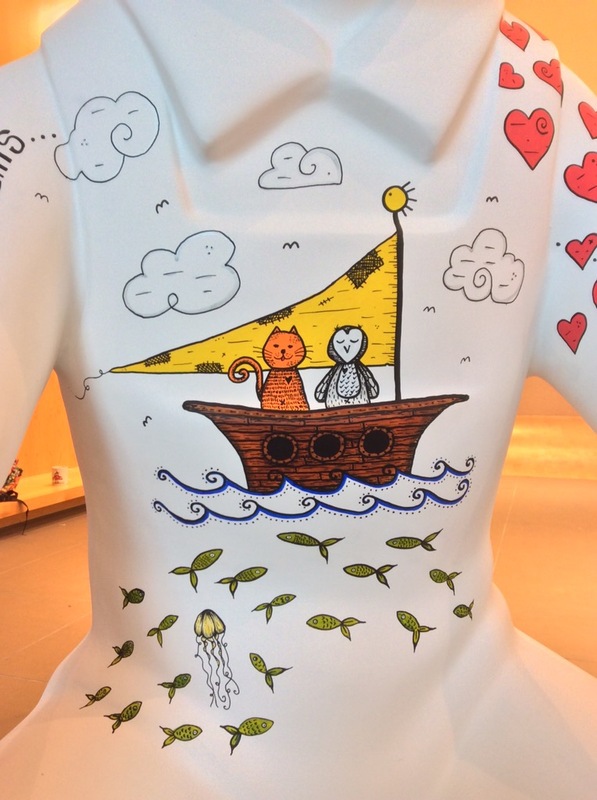 These told the story of a wee girl catching her dreams based on a well known character Suzanne draws and the owl and pussycat in their boat, which is a version of work that she did for Bramble Cottages young people’s units in Arbroath. 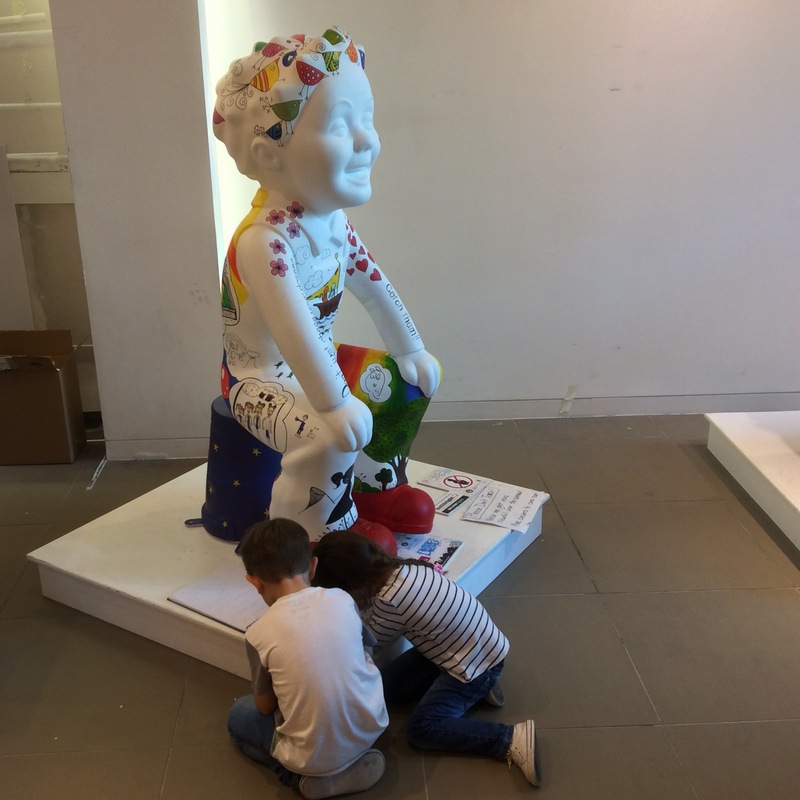 The kids then started to help her fill in the gaps with their work. 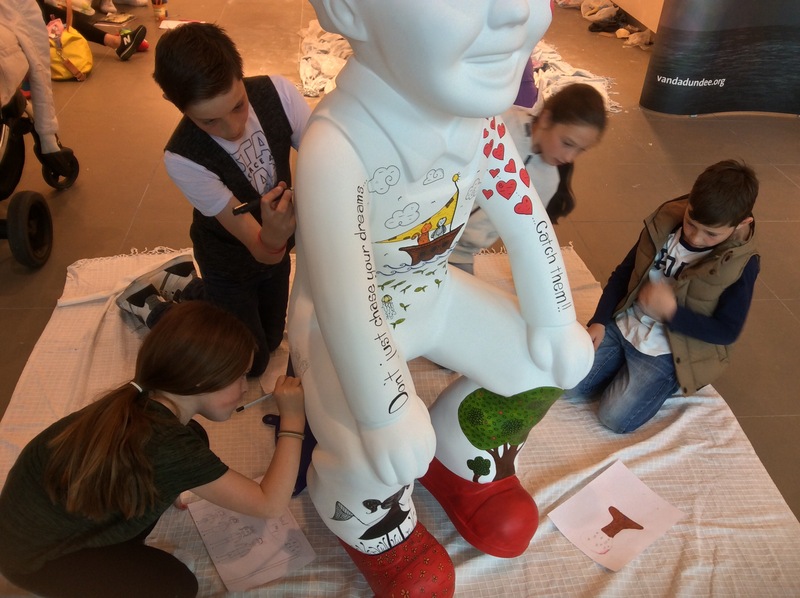 Some were brave enough to draw straight onto Oor Wullie, others entrusted Suzanne with tracing their designs on for them. 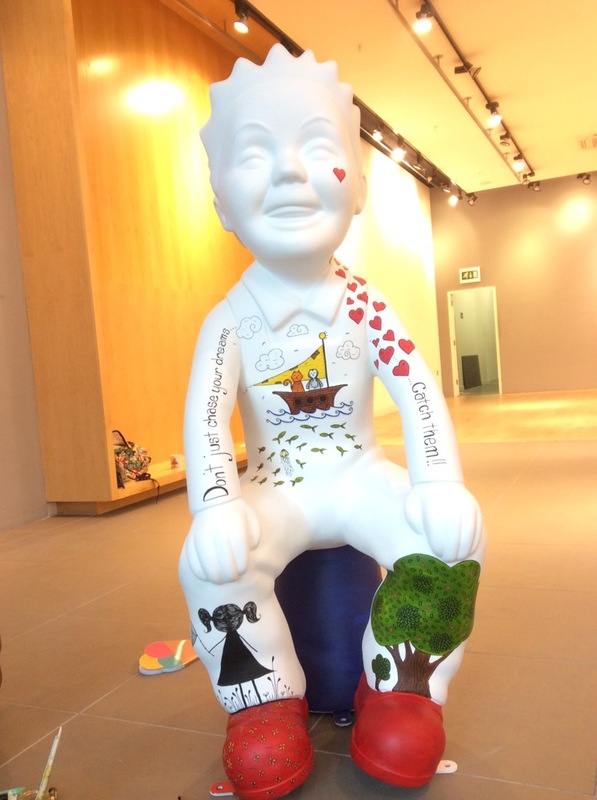 There is a huge house on the back of Wullie’s dungarees ‘the foster home of dreams’. 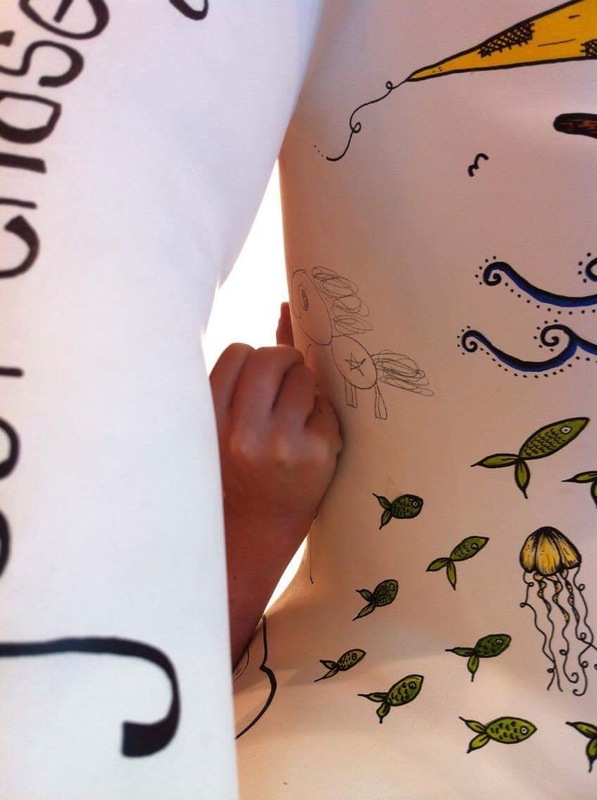 It tells the lovely story of two young people who say that their foster carers are just wonderful. 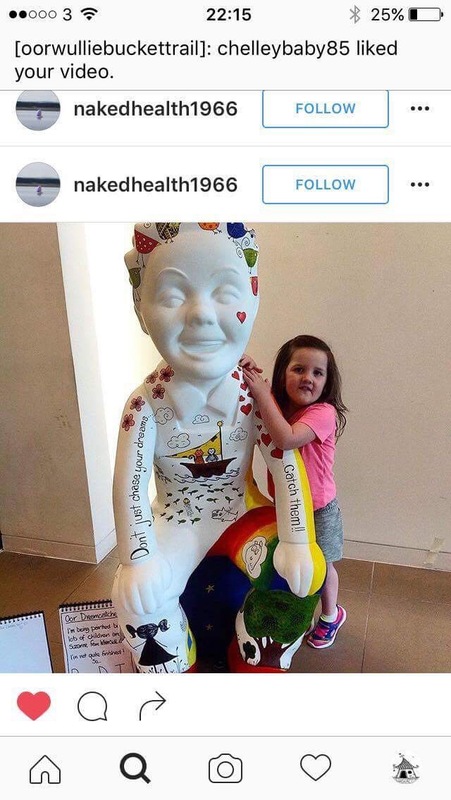 They paint a picture of an amazing positive foster care experience that we (and they) would wish for every looked after child. 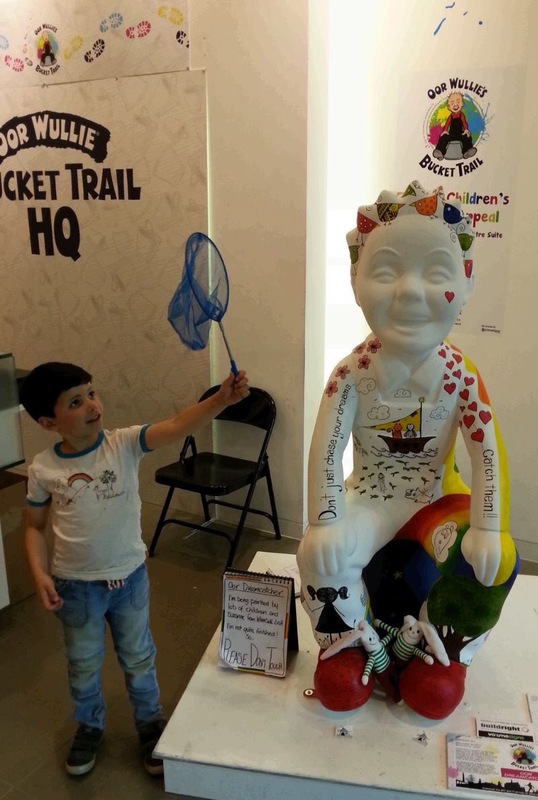 There are dragons, unicorns, leprachauns, a candy floss tree with blue bon bon people, sharks, dolphins, foxes, cats, rabbits, Dennis the Menace, shoes, a secret padlock from the infamous Dymagate and dreams of trips to Disneyland. 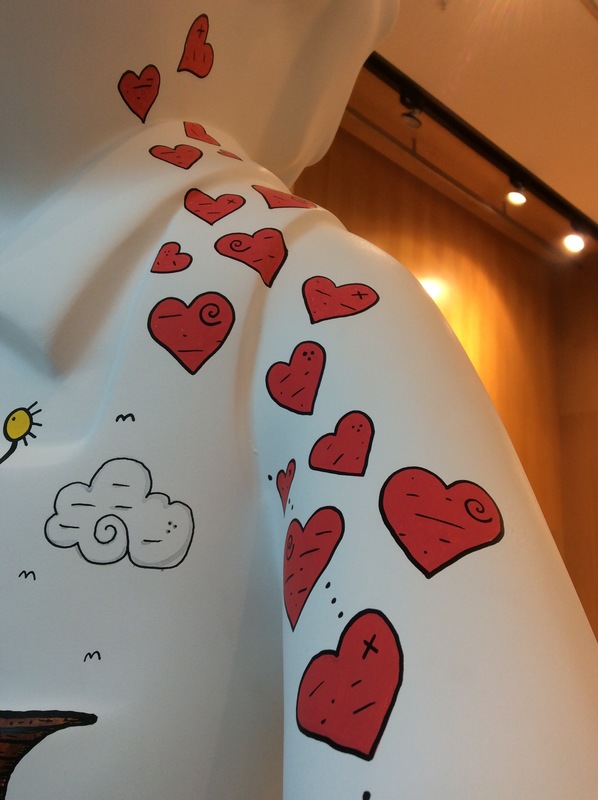 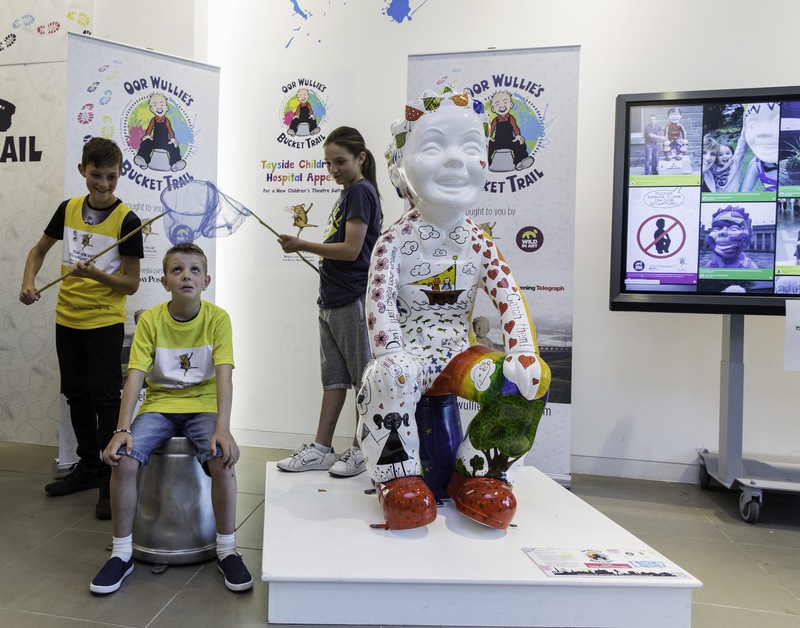 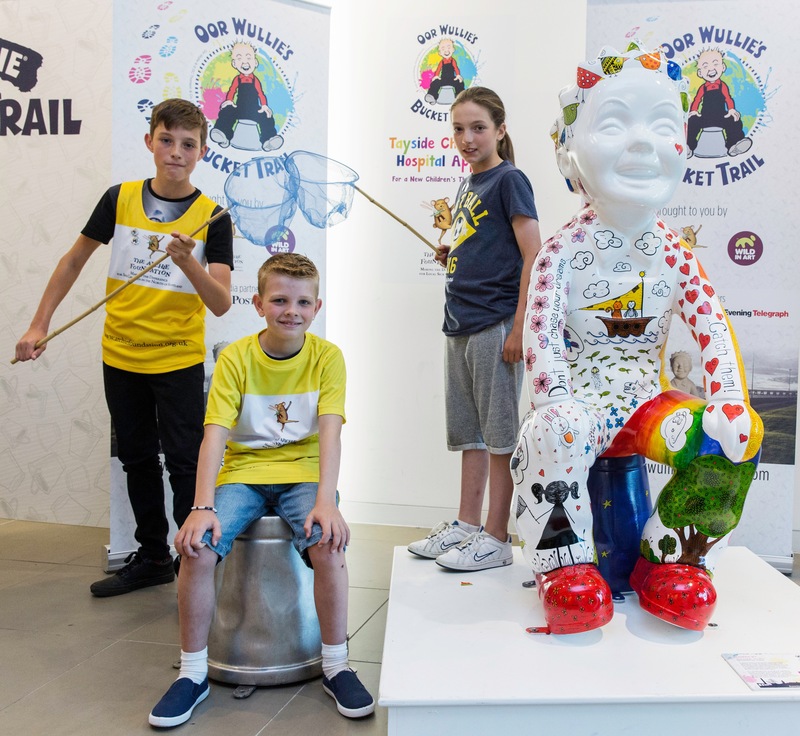 All in all 16 young artists helped Suzanne and Oor Wullie catch their dreams over the summer and around 200 more helped decorate the Bucket Trail HQ walls with their dreams too. 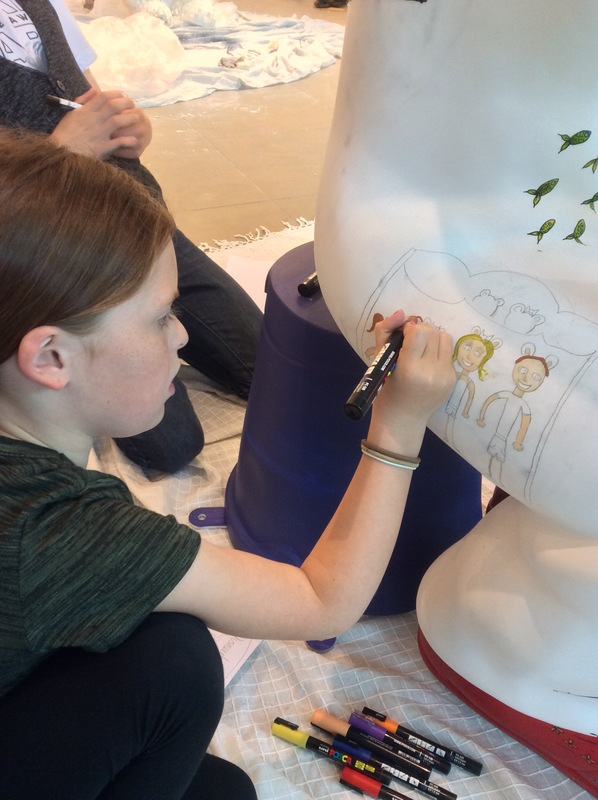 Caitlan drew a wonderful bunny, which can now be found on his hand! 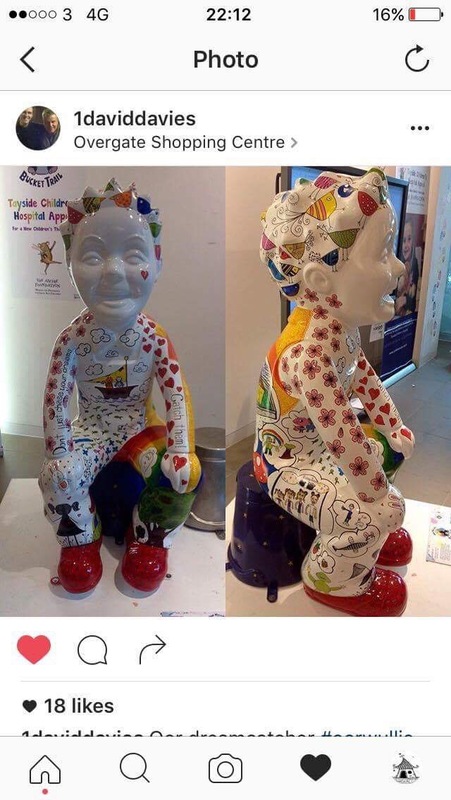 You can find Oor Dreamcatcher with the rest of the gang at Slessor Gardens 9-11th September before he goes to auction on 13th September to raise money for the ARCHIE Foundation Tayside Children’s Hospital appeal. 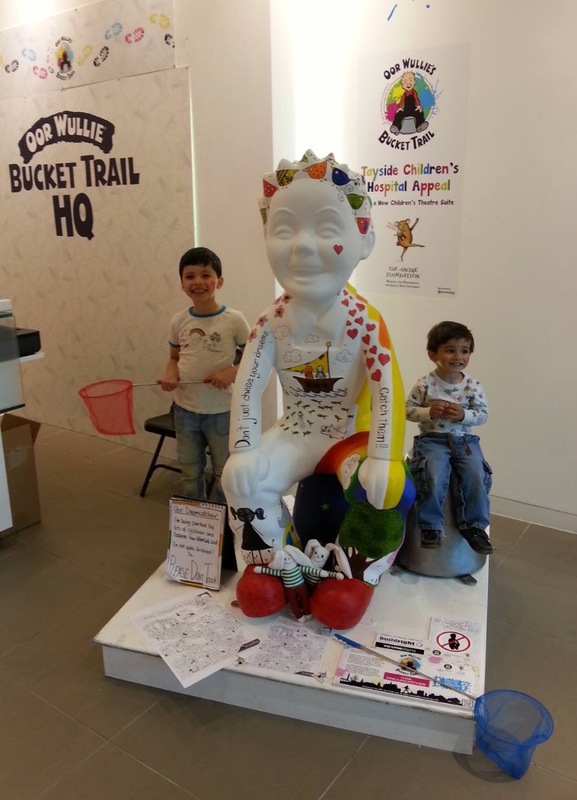 We hope they raise lots for a hospital that will go on to help so many children throughout Tayside for years to come. 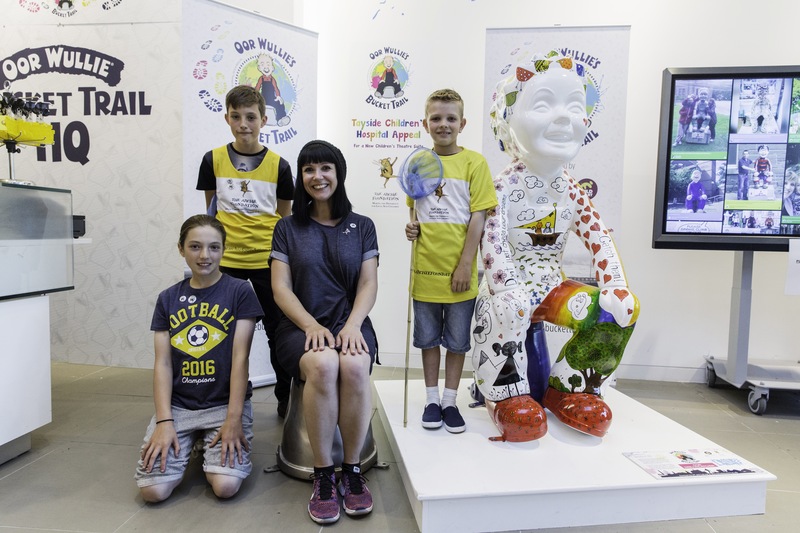 Me and some of my Dream Team! 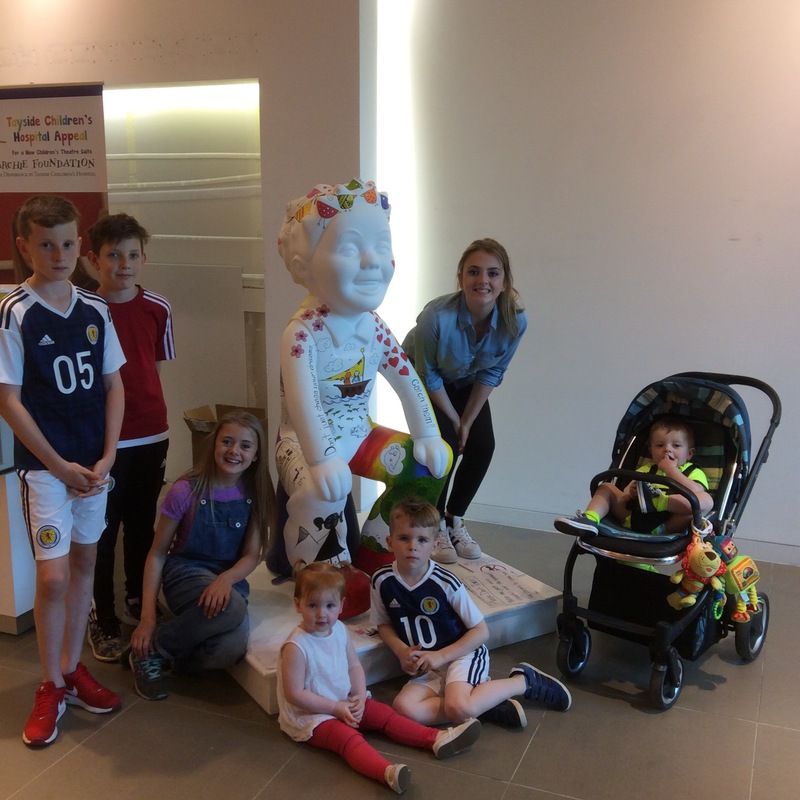 Some of the Dream Team catching dreams with Oor Dreamcatcher, Charlotte Taylor (11), Alfie Taylor (12), Brandyn Bowie (9). 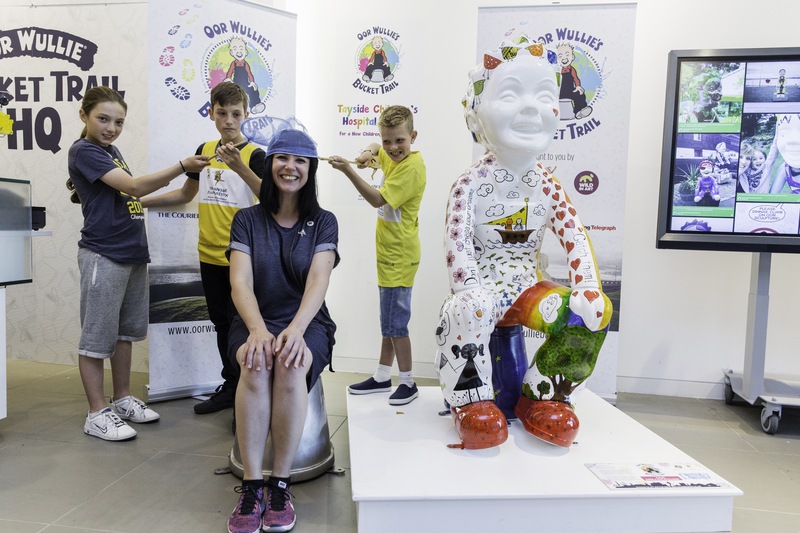 We made it into the Evening Telegraph!